After winning the 2015 and 2016 Dirty Kanza 200, Amanda Nauman showed how cyclocrossers used to racing for an hour can cross over to gravel and succeed during long grinds in the saddle. 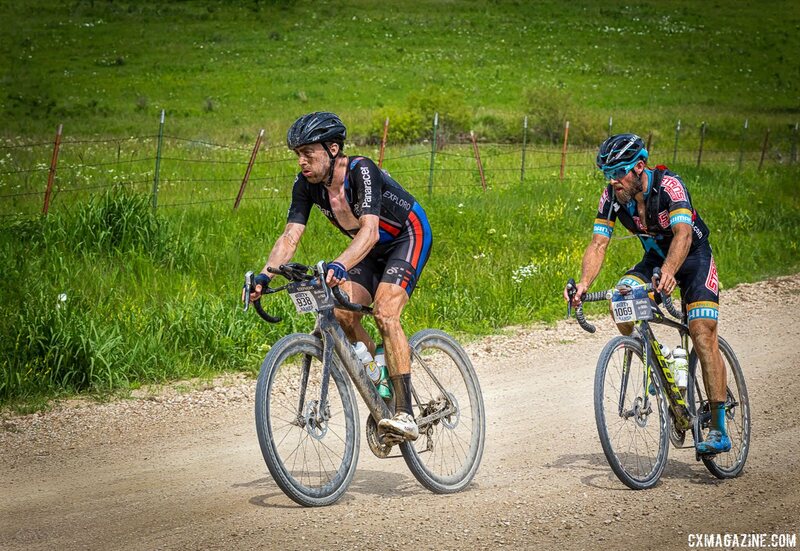 Last year, Jake Wells tackled the Dirty Kanza for the first time and joined Nauman on the list of successful ’cross/gravel crossovers. Wells finished second behind Mat Stephens to cap a successful first trip to the gravel roads and hills around Kansas. After his gravel success, Wells was not done for the 2017/18 season. 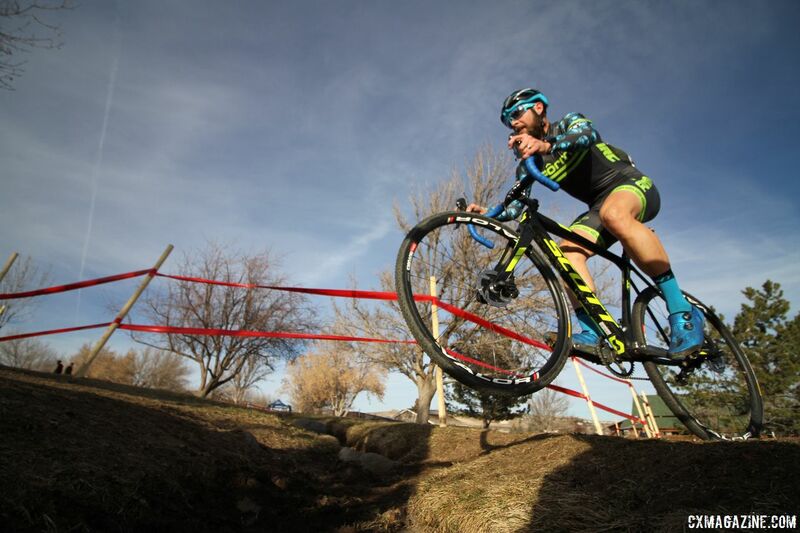 Wells more or less retired from racing on the UCI cyclocross circuit this past season and celebrated his retirement by doubling up at Reno Nationals with wins in the Masters 40-44 and Singlespeed races. Whether it be 11 hours or 1 hour, Wells showed he can race his bike and race it well. Speaking of his bike, Wells has gotten a lot of use out of his Scott Addict CX. He rode the platform at Dirty Kanza last year, then rode it to the win in the Masters 40-44 race in Reno and then switched it to a singlespeed setup for his win in that race. With Wells’ strong racing across disciplines on his cyclocross platform, we wanted to learn more about his secrets to success. After all, many of us are likely to give gravel a go on our cyclocross bikes using our ’cross-centric training. Maybe Wells has some tips that could help those of us looking to pull off the gravel crossover ourselves. We asked Wells a number of questions about his bike setup and training during gravel season in the Q and A below. For more on the same topics, also check out our interview with Amanda Nauman. Cyclocross Magazine: You race gravel on a cyclocross bike, right? 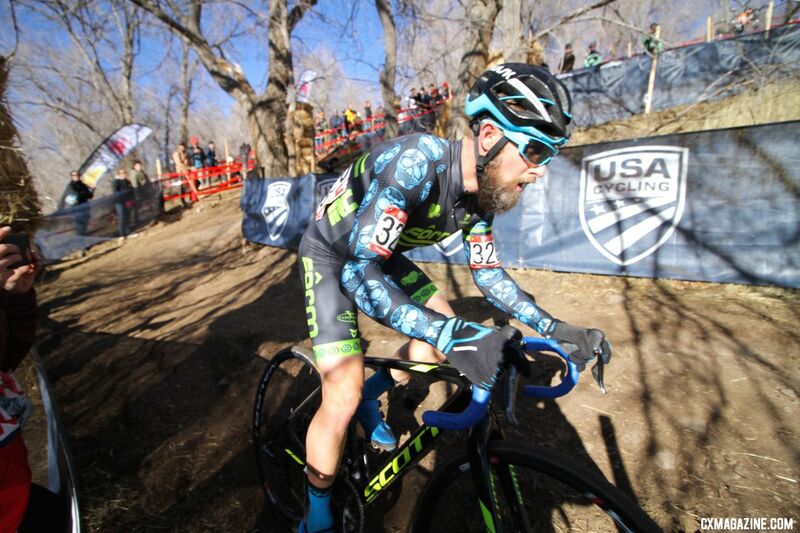 Jake Wells: Yes, I ride the Scott Addict CX bike for both cyclocross and gravel … and road for that matter. CXM: Why have you chosen that bike? JW: This is the top-of-the-line cyclocross offering from Scott, and I find that the geometry is such that I am comfortable with my position whether I am racing a 1 hour cyclocross race or an 11-hour Dirty Kanza race. I make some changes regarding wheels, tire sizes and treads and gearing depending on the event and terrain. CXM: What aspects of your bike are good for gravel riding? JW: First and foremost, I think tire clearance is key. I’ve been logging some miles this winter and spring on the new Bokken tire from IRC. Those tires, in a 40mm, with the Stan’s NoTubes Valor or Avion wheels can balloon out to 42mm wide. Tubeless tires in 40mm can make for a pretty cushy ride even with the stiff “race geometry” of the Addict CX. CXM: What are some of the shortcomings, with respect to other options? JW: Well, I think as a mixed surface race bike, the Scott really does it all pretty well. If someone was looking for something more along the lines of an adventure bike, then having the ability to run a 650b x 50mm tire might be desirable. That type of rider might be looking at some suspension options as well, like the Fox AX or the Lauf Grit fork. But for my needs, the Scott Addict CX is a great fit. CXM: What changes to your cyclocross bike have you made for gravel, or what mods do you want to make? JW: The main changes that I make after ’cross season are the gearing and tires. I swap the crankset out from a Shimano 46/36t for a more capable Pro Compact 52/36t. I also change out the cassette. I typically run an 11-28t cassette during cyclocross season, and I swap it for the 11-30t DA option for gravel events and training here in the Rocky Mountains. I will bounce around from the UCI-legal 32mm Serac CX tires in ’cross season to the Serac Sand or the Bokken for gravel and the Formula 28mm road tires, all tubeless options from IRC. Wheel options also come into play. The Avion wheels are a more aero, deep dish offering from Stan’s NoTubes (the same wheels that Matt Stephens was riding last year in Kansas). Whereas the Valor wheels are about 200 grams lighter and more vertically compliant than the Avions. CXM: Do you keep a gravel specific build year round? JW: I do the majority of my training on the pavement and fire roads here in Colorado, so I will typically leave the heavier gearing on the bike and swap out wheels and tires depending on what works best for the terrain. CXM: Do you think cyclocross bikes are good for gravel? JW: Yes, I think cyclocross bikes can be a great option to double as your gravel bike or even a road bike, but it depends on the geometry and what exactly your goals are with the bike. CXM: Are you planning on sticking with your cyclocross bike or are you looking to switch to a gravel platform? JW: This season I will be switching from the Scott Addict CX frame to the Scott Addict Gravel frame, but honestly the two are very similar in regards to geometry and carbon layup, so not much of an adjustment for me. CXM: I saw some aero bars in one of your Instagram posts. Has Mat Stephens’ DK200 bike worn off on you? JW: Ha! Absolutely. Around the 160-mile mark, I was pretty envious of Matt’s aero bars last year in Kansas. So this year I decided to have the option. I was in Arizona in March doing a week of gravel riding with The Cyclists Menu, so I decided to use that opportunity to get in some hours in that position and get used to handling the bike from the aero bars. With the Di2 setup they are pretty easy to remove and install. However, I will not be using them for the Belgium Waffle Ride this weekend. Too much climbing. CXM: How do you carry your tools? JW: Again, it depends on the event and the demands. Last year at Dirty Kanza I was using a lightweight hydration pack from Shimano, and to save time I had two identical packs so I could drop one and grab a new fully stocked one at the aid stations. For that race I had a multi-tool, an extra tube and extra CO2 cartridges in each pack. But for training and shorter events I will usually just run a pack under the seat and a small hand pump in my jersey pocket. CXM: What’s in your saddle bag? JW: An extra tube, a plug kit, two CO2s, multi-tool and $20—to act as a tire boot, buy snacks in case I completely come apart or need to bribe someone to give me a lift if all else fails. CXM: How do you carry your water, food and other gear? Camelbak? Front bag? JW: For shorter events I will typically just stuff my jersey pockets, or use the Unzen2 hydration pack from Shimano. I also have a top tube bag from Dark Speed Works that I use on long days for quick-grab food and a power pack to keep the GPS going. CXM: Do you swap treads or volumes for each race? JW: Yes, It’s good to have options. CXM: What are you typically choosing from? JW: I love the offerings from IRC. The Formula PRO, a 28mm tubeless road slick. The Serac CX, a great general conditions tread for ’cross and when you need more traction on gravel. The Serac CX Sand, a 32mm file tread, and Serac CX Mud, which is … a mud tread. And the Bokken, a 36 or 40mm file tread with a nice side knob. CXM: Does weather affect race-day choices? JW: Yes, absolutely. If it’s rainy or muddy, then having a tire with better mud shedding properties and more frame clearance is the way to go. CXM: What are your gravel plans for this year? Returning to the DK200? 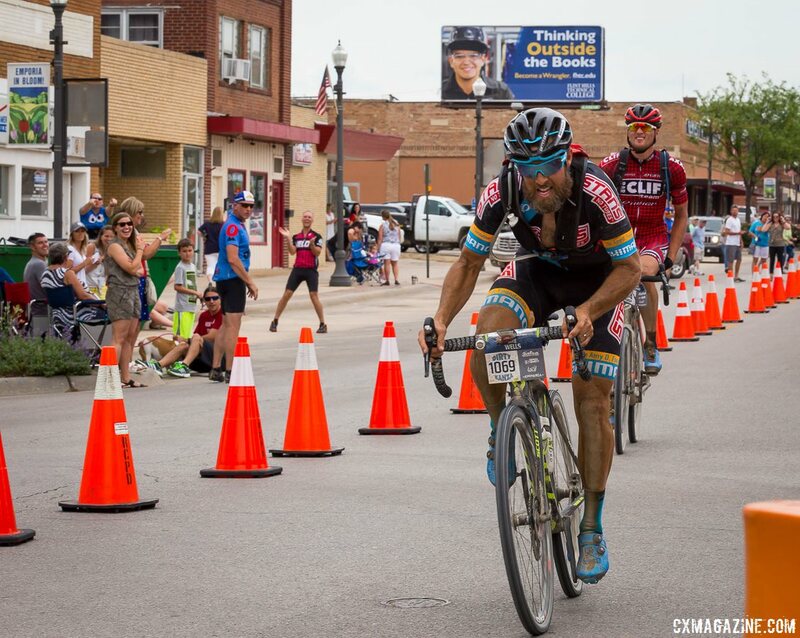 JW: Yes, doing the Belgium Waffle Ride on April 15th, Dirty Kanza on June 2nd and Gravel Worlds on August 18th. Those are the main races I’m focusing on this year. CXM: Is your gravel season training drastically different from cyclocross season? JW: With gravel races the events are typically longer with more sustained and manageable efforts, so my training consists of some really long days on the bike, but I like to do long sustained climbs at upper end of tempo. Obviously there is some adjustment to get used to the difference in equipment and bike handling required for each discipline. Usually for ’cross I’m banking on the endurance from the spring and summer of training and racing and then focus on some specific VO2 and anaerobic work with some longer three to four rides mixed in. CXM: What helps you succeed at both long and short distances? JW: Oh man, that’s a tough one. I think a lot of it falls into having a lifetime of endurance training, starting with running cross country and track back in junior high and high school and on into college. Over many years, I have been able to train endurance and metabolic efficiency, but I also I think I have a naturally high-capacity for buffering lactate and the ability to put down a lot of watts for a short amount of time, recover quickly and do it again and again and again. CXM: Does the high volume of riding from gravel season help for cyclocross? JW: I think it does, to a point. If someone is focusing on the right kind of efforts during those long days then it increases their aerobic capacity and can essentially push up their “cruising speed.” This doesn’t necessarily make the hard efforts of cyclocross any easier, but the ability to keep a high pace throughout the entire effort is increased. CXM: How much of high intensity intervals do you do during gravel season? JW: During the gravel season I don’t do much of the VO2 or anaerobic capacity work. I typically rely on the local short track and mountain bike races here in Vail for those mid-week intensity efforts to bring that along. Most of the gravel events are a battle of attrition without a lot of time spent above threshold. CXM: What advice do you have for ’crossers looking to add some 60+ mile gravel rides this year? JW: Definitely do it! I think it’s a great way to change up the training and focus for the summer while taking advantage of the crossover ability of the equipment. It’s a great scene with lots of amazing people at the races. CXM: Do you race with a power meter? JW: Yes, I train and race with a Stages power meter on my gravel, cyclocross and mountain bikes. I’m kind of geek for the numbers side of things, but I try to keep it at a manageable distance try not to over think it. CXM: If you do, what do you look at data-wise? JW: I typically use the power numbers for training, and I’m fairy tuned into the numbers then, but when I’m racing I don’t focus too much on the data. I will keep track of sustained efforts and check in with heart rate values when I’m really pushing it but try not to stare at my stem. I always like to capture the data if possible and go back after the fact and dig into it a little deeper. Last year at Dirty Kanza, I turned off most of the extraneous features on my GPS to conserve battery life (it ended up being fine and having plenty of power left), so I wasn’t capturing power, just heart rate, distance and time. In that race I couldn’t help but fixating on the “miles to go to finish.” I’ll tell you, with 12 miles to go, even at 19+ mph, it seemed like we were riding in slow motion. CXM: Thanks for your time. Good luck with your gravel adventures this summer!